I take a couple hundred photos per day. Most are landscapes, animals and sky scenes, mixed in with sometimes hundreds of screenshots. No matter how much content you generate, the "fire and forget" nature of mobile photography can quickly lead to unmanageable photo libraries. The problem is most pronounced in iPhones with large storage capacities, which let you shoot with reckless abandon. 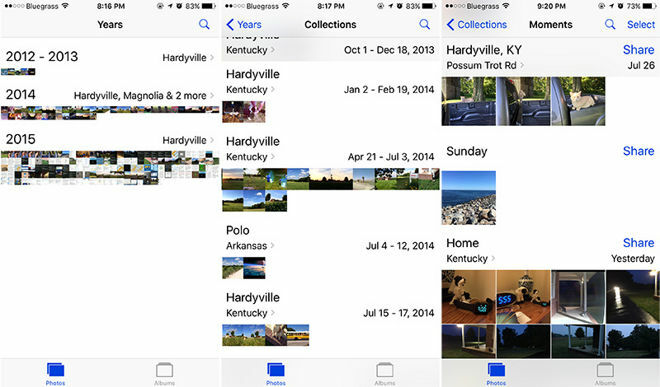 Fortunately for heavy users like myself, the aggregation and collation features Apple built into the iOS 9 Photos app can help with basic organization before you even think about comprehensive cataloging. When you first open the Photos app in iOS 9, you are presented with up to three navigation options: Photos, Albums and, if you are sharing photos with a friend, Shared. In previous versions of Photos, when you clicked on Albums you were presented with Camera Roll, which is a collection of every photo and video on your iPhone, a Favorites album, Bursts for photos taken in rapid succession and Recently Deleted. New iOS 9 Albums (left) and photo scrub bar. 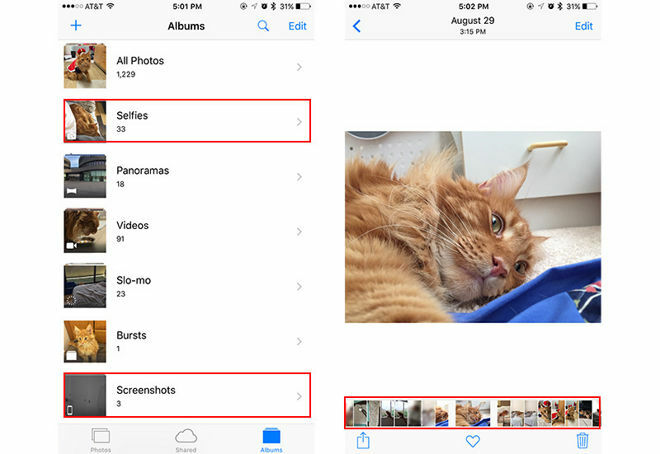 In addition to Camera Roll's name change to "All Photos," two new albums have been added to Albums in iOS 9: Selfies and Screenshots. The Selfies album contains shots taken with the front-facing FaceTime camera and the Screenshots album contains images captured by pressing the sleep/wake and home buttons simultaneously. iOS 9 automatically populates Favorites, Bursts, Selfies and Screenshots with associated content. These albums are hard coded into iOS 9 and cannot be renamed, reordered or removed. Albums will, however, hide if you do not have any photos of that type. I usually don't have selfies on my iPhone, therefore that album never shows up. It should be noted that all stored photos will be placed in their respective albums based on metadata, even those not captured by your iPhone. For example, selfies taken on a friend's phone and imported via Messages or AirDrop go into your Selfies album. When you open a single photo in iOS 9 there is now a "scrub bar" at the bottom of the screen to quickly browse through photos in the album you are viewing. You can "scrub" left and right through your entire collection or single albums. At the bottom of the screen are icons to share, favorite, or delete. One way to quickly add photos to an easily accessible album is to tap on the heart-shaped icon that appears below individual pictures. Doing so sends that photo, Live Photo or video to the Favorites album, which is near the top of Photos' file hierarchy. Further, content can be automatically removed from Favorites by deselecting the heart button. For an aggregated view of all your content, select Photos at the lower left of the main Photos app screen to browse by date and location, broken down by Year, Collections (groupings by location and date) and Moments (specific dates). From the Moments screen you can click Share to share a block of photos the app has grouped together. If you tap Select at the upper right, you can select each group of photos to delete if desired. You can add as many additional albums by clicking on the "+" icon in the top left-hand corner and selecting pictures from Years, Collections and Moments. These newly created albums are not smart, however, meaning you have to add and delete photos manually. The locations of photos are extremely accurate which really help you remember where you took that photo of a beautiful sunset or mountain vista. Photos shared with you show up on this map as well if the sender had location turned on. 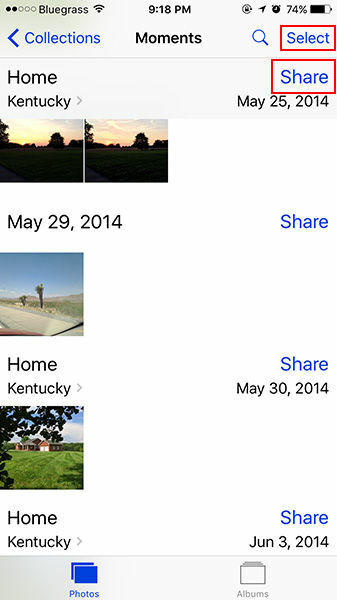 Location can easily be turned off if you want to share photos, but not your location. Navigate to Settings > Privacy > Location Services > Camera > Never to disable location sharing.